The pre-set menu choices based on location and illuminated 5-way button control panel make these units the best Trophy Cam ever. Field-proven design with a removable "ARD" anti-reflection LED cover, strengthened cable lock channel and an improved latch for maximum ruggedness. These no-glow models feature black LEDs that are invisible to both game and other hunters. These models provide stunning Images with a super-fast 0.2-Second trigger speed, Hyper 0.5S recovery rate, extended nighttime photo range and true 1-year battery life. The Trophy Cam HD no glows are exactly what hunters have been waiting for. Features:- Lightning fast 0.2S trigger speed- incredible 0.5S recovery rate- 100' detection distance- pre-set menus and backlit 5-way buttons for easy setup- dynamic video- true One-Year battery life for all season scouting- unparalleled night vision distance and brightness- no-glow black LEDs: select Trophy Cam models with no-glow black LEDs are totally invisible to game and other hunters. 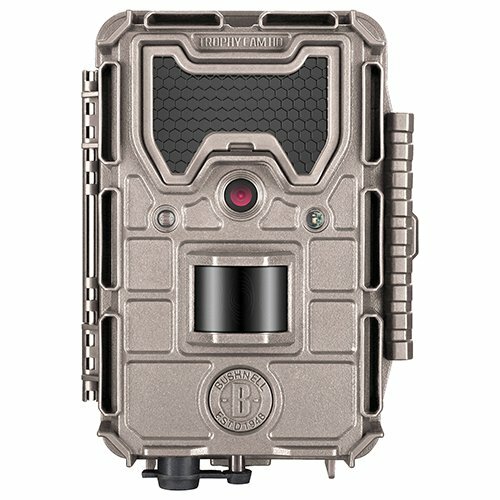 Also ideal for security surveillance.- HD video: all Trophy cams are capable of capturing 720P HD video - with sound - for a brilliant connection to the game you hunt.- hybrid capture mode: capture full resolution Images and video simultaneously on every trigger.- data stamp: every image is automatically stamped with day/date, temp and moon phase at time of capture.- Hyper PIR: motion sensor reaches out to 60' or beyond and offers dramatically expanded coverage area over leading competitors.- multi flash mode: allows you to adjust flash power for different setups to conserve battery power where applicable.- freeze frame shutter: night vision shutter speed adjustment for ultimate stop action Images.- Hyper night vision: a Quantum leap in distance and brightness, this system ensures that sharpest after-dark imagery.- GPS Geotag: every Trophy Cam has the option to automatically embed GPS coordinates to make tracking game movement and camera placement simple.